I can't believe it is still hot here in through UK. We are not equipped for it! I continue to love it though. I can't bring myself to sit at my pc as it is in the warmest room in the house. This means my usual Internet use is much reduced. I have, however, been knitting like a demon. 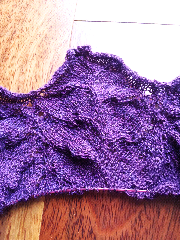 Maybe it's time to update you on my latest shawl obsession, Maplewing by Anne Hanson. I have to confess, as the pc is in a very hot room, these photos are taken on my phone, so I apologise for the poor quality. I have been obsessed with this shawl. It's a really lovely pattern that is fairly simple to keep straight. I have, thankfully, reached the first decrease row. 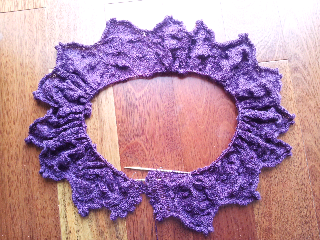 I'm knitting this shawl while watching the French Open Tennis Tournament. When the match gets really gripping I knit socks! This has meant finishing my Kaffe Fassett socks and casting on some Erika Knight Socks. I'm sorry this is so short and sweet. 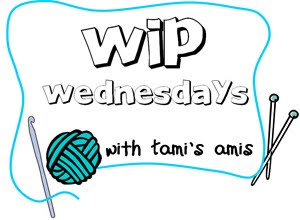 It's too hot to be worrying about blog posts! Click on the button to see the projects of other people who aren't passing out with extreme weather.